Externalizing behaviors are a common co-occurring issue in young children with autism spectrum disorder (ASD). One evidence-based treatment for disruptive behaviors that has shown empirical and clinical success with a range of specialized populations is Parent-Child Interaction Therapy (PCIT). While the accumulating research for implementing PCIT with the ASD population is promising, clinical parameters for PCIT practice with ASD are dynamically evolving. 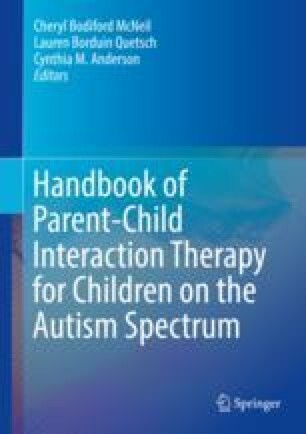 The chapter presents lessons learned from the authors’ research and clinical experiences when implementing PCIT with the ASD population. The organization of the chapter overlays PCIT concepts onto the ASD diagnostic framework of the DSM-5, including severity and functional level of impairment. Although PCIT is a robust intervention which typically requires minimal changes in implementation for a variety of populations, having a basic understanding of ASD symptomatology and using level of functioning to inform when and how to tailor PCIT to ASD populations is crucial in obtaining positive clinical outcomes. Masse, J. J., & Girard, E. (n.d.). PCIT time-out procedure flipbook. Retrieved from http://www.pcit.org/store/c4/Flip_Books.html. Oink [Def.1]. (n.d.). English Oxford Living Dictionaries Online. Retrieved January 13, 2018, from https://en.oxforddictionaries.com/definition/oink.